B-MAX Vitamin Methylcobalamin B12 1000mcg is premium strength vitamin B12. Suitable for Vegetarians. As vitamin B is necessary for the formation of red blood cells, B-MAX can help reduce triedness and fatigue. 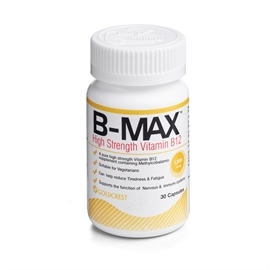 B-MAX™ is a premium quality Vitamin B12 supplement, made with pure ingredients and suitable for vegetarians. B-MAX™ contains 1000mcg Vitamin B12 which is a vitamin that helps normal nerve cell activity. B-MAX™ supports the production of red blood cells & helps cell division. B-MAX™ helps strengthen the immune system and reduces feelings of tiredness & fatigue. Pure High Strength Vitamin B12 containing Methylcobalamin. Approved by the Vegetarian Society, suitable for vegans, Halal & Kosher. Methylcobalamin is the active, coenzyme form of Vitamin B12. While the body can readily absorb Vitamin B12 as cobalamin, it must further convert it to a coenzyme form, methylcobalamin, to become metabolically active. In this form, it is bioidentical to the predominant and active form found in the body. The body-ready Vitamin B12 in this formula is offered in a convenient dosage form which is also suitable for vegetarians. The B-MAX® formula includes a unique property OptiZyme™ which ensures your body will absorb a higher level of Vitamin B for your body to utilise. The impact of this unique formula in turn gives you the best possible results for the best possible price. OptiZyme™ absorption technology has been clinically proven to significantly enhance the absorption of Vitamin B in the body. Each Vitamin B-MAX® capsule contains OptiZyme™ which increases the bioavailability of nutrients into your body giving you more Vitamin B absorption therefore higher levels. B-MAX® has been formulated as a capsule rather than tablet as it has been proven to further increase absorption of the product more efficiently. Research has also shown that people prefer taking capsules than tablets as they are easier to swallow and this product was designed with our consumers requirements in mind. Capsules are also seen as healthier than tablets because as a rule they do not contain unnecessary constituents such as binders, fillers and diluents which can often make up 85% of the tablet. Vitamin B12 is essential for the proper functioning of human body. It forms red blood cells, which supply oxygen to the different body tissues. It also helps to maintain the level of amino acid, which reduces heart disease risk. Vitamin B12 deficiency leads to pernicious anemia as well as permanent brain and nerve damage. Preventing vitamin B12 deficiency is very important. It should keep in mind that this water-soluble vitamin is direly needed in the growth period of children. You can easily get vitamin B12 in your daily food. Take vitamin B12 supplements only when you are having problem with your blood cells or nervous system. Less consumption of green leafy vegetables. Surgery in which an intestine is removed. Excessive use of acid-reducing pills or drugs. Use of only vegetarian diet. Methylcobalamin is the active, coenzyme form of Vitamin B12. While the body can readily absorb Vitamin B12 as cobalamin, it must further convert it to a coenzyme form, methylcobalamin, to become metabolically active. In this form, it is bioidentical to the predominant and active form found in the body. The body-ready Vitamin B12 in this formula is offered in a convenient capsule dosage form which is also suitable for vegetarians, is halal and kosher. B-Max™ has been developed by clinical healthcare experts. The ingredients have been carefully formulated with research to ensure they deliver results. B-Max™ is also recommended by nutritionists. Other ingredients: In a base of cellulose fibre (399mg), vegetable cellulose. I bought B-Max because my doctor told me that I needed to start taking a vitamin B supplement as I was told I am deficient in it. My chemist recommended that I take B-Max and it is very good. I started to feel increasingly weak and tired so when I was tested, my doctor told me I was deficient in vitamin B which was probably a result of going vegan almost 4 years ago now. Since I bought B-Max, I have been taking it everyday and Im not suffering from deficiency anymore! Doctor recommended vitamin B tabs. I need a pharmaceutical standard vit and B-MAX fit the bill. Its brilliant. I needed vitamin B tablet but only B-MAX is right for me because it is fully vegetarian. Most vitamins have gelatin capsules. This is the only one I trust to take. Bmax is brilliant!! Highly recommend it! B-Max was recommended to me by my sister who is also deficient in vitamin B12. Its such a great quality item. I love it. This has done a great job for me. I feel more energetic and lively since I started taking it. B-max is good supplement for anyone who needs to take it if they are deficient in B12 like I am. Most of my family members need vitamin B tabs. It must be a genetic thing. We all take B-Max and it is very good for us all. I read about how important vitamin B is to the human body. I never really thought about it before reading lots of articles on it because it isnt the most popularly known vitamin but it turns out so many people go undiagnosed and I have definitely seen an increase in energy levels since taking it so I would definitely recommend it! Super supplement! 5 stars for B-MAX!! B-Max is by far the best vitamin B supplement Ive taken. I think having it in capsule form rather than a tablet makes it much more effective. This is the best vitamin B. I need to take it because I have low levels. It is a high quality vitamin B supplement. Very good! B-MAX comes in a smart little bottle with a months supply. It is a great high quality item and is amazing value for the price I got it at!! The only fully vegetarian vitamin B supplement I could find! Most vitamin B capsules contain gelatin but B-MAX has capsules made of vegetarian cellulose and is perfect for me!